"Accurate Cutting" is a very important part of quilting and has a direct effect on your joy in quilting. 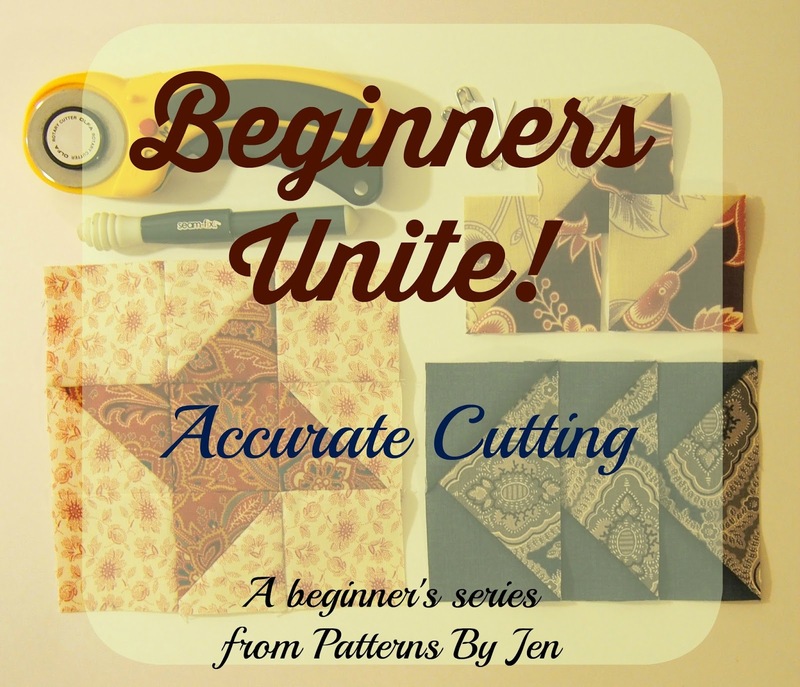 Here is a quick little video on how to square up your fabric, make that first cut to get a straight edge, and how to line up the ruler for more accurate cuts. Hopefully, I can keep the first cut as small as possible, but sometimes that isn't the case and you have to cut off what seems like a big chunk of fabric. Ouch. Do not decide to skip this part! You will regret it in the end. When you don't get the fabric grain straight you end up with pulled and wacky fabric and your stitching accuracy goes way down. 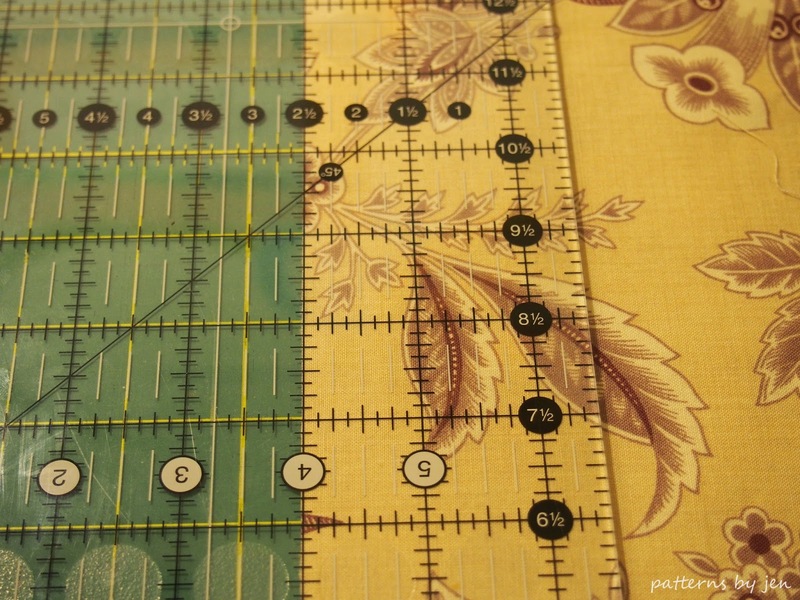 This directly effects how your units, blocks and quilt tops go together. Once you have your straight edge you can start to cut out your pieces. All of my patterns call to cut pieces a certain width x the width of fabric. Ex: Cut five strips 2 1/2" x WOF. That's what I will demonstrate here. 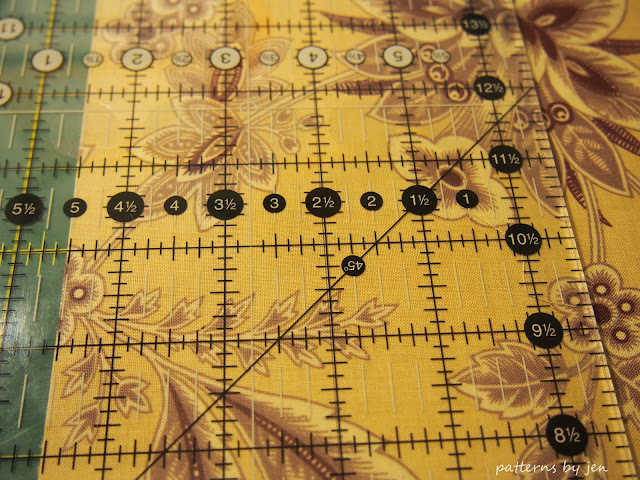 The first picture shows where I line up the 2 1/2" mark on the ruler and the edge of the fabric. Note: I'm right handed and I have no idea how to show left handed. My deepest apologies. :( If anyone has good links for those who are left handed, please share in the comments!! Once I make that first cut I once again line up the 2 1/2" mark on the cut fabric line. 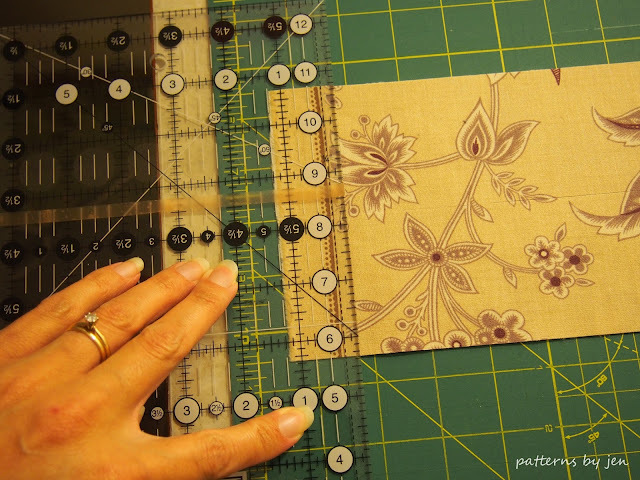 If I am using dark fabrics, then I move the strip I just cut, but otherwise I like to keep them where they are at until I am done cutting the pieces I need. If you look closely you can see that the ruler is lined up so that the cut line is actually visible to the left of the ruler mark. Once I have my strips cut I usually cut off the selvage. There is no reason for this, I just usually forget to cut it off beforehand. You can certainly trim it first. No judging here!! Next, I start cutting the individual pieces. In my patterns after I have you cut the strips, I then tell you how many units to cut. Ex. Sub-cut into forty-two 2 1/2" x 4 1/2". Without moving the strips, I cut the units, again lining up the ruler just inside of the fabric. If you have tips for accurate cutting, please leave them in the comments. If you just want to comment on how terribly uncomfortable I look on camera, you can do that, too! Enjoy these outtakes, free for your enjoyment. I had to learn how to tell left-handed students how to cut so I'll share it with you Jen. It's really very easy. 1. Instead of cutting from the left side of the trimmed fabric, spin the fabric so the trimmed side is on the right. 2. 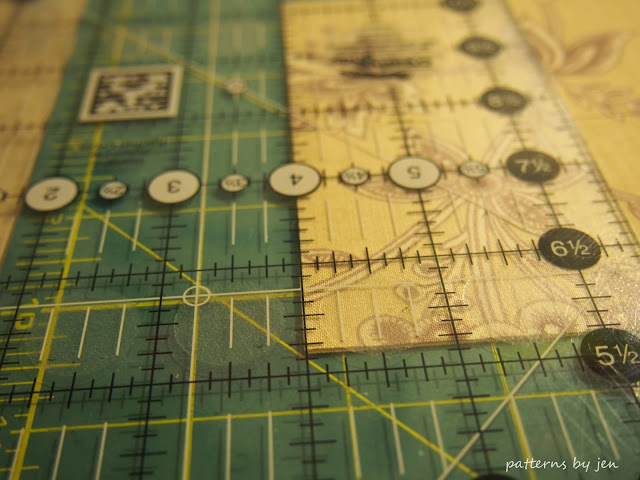 Rotate the creative grids ruler so the black number dots are running down the left side and across the top. 3. Place the 2-1/2" measurement on the trimmed edge of fabric and use the left hand to make the cut for the strip. Easy peasy! It's just remembering to spin everything opposite of how you do it for right handed cutting. Does any of that make sense?? Beth, thank you so much!! I am going to try this in a quiet moment. I didn't want to confuse anyone since I have no idea how to show it as a lefty. I really appreciate this! !